The fifteenth century was a time marked by pageantry, carnivals, and allegorical processions. This era also spawned the birth of sixteenth century costume parties and, ultimately, what is known today as the masquerade ball. Traditionally, Victorian masquerade parties required that guests attend in formal attire wearing masks covering the upper part of their faces; however, modern re-creations are seeing them becoming more like their 1500's counterparts with full costumes and role playing. In recent years, masquerade parties have been making a resurgence because they add a hint of mystery that is not always present at regular costume parties. Although masquerade parties can be planned for small, intimate groups, the general idea is "the more the merrier". It is much easier to get beyond the disguises and much more difficult to hide your true identity in a smaller gathering. Masquerade parties are a great way to celebrate birthdays, proms, graduations, New Year's Eve, or any other special occasion, and allow family, friends, neighbors, and even community groups to interact and socialize in a fun setting. There are countless themes to choose from and your party can be tailored to accommodate your personal needs and preferences. Although masquerade parties do not have to be difficult to organize, it is important to begin the planning process well in advance, since your guests should be given sufficient time to gather costumes. Venues may vary depending on the size and theme of your party. If it is a smaller gathering you could host the party in your own home, but larger events may require securing a facility several months ahead of time. School gymnasiums and banquet halls are a good choice because they can be decorated to suit any theme and provide sufficient room for guests to mingle and socialize. Check with your Chamber of Commerce or Town Hall, since many businesses and organizations are often willing to rent out libraries, art galleries, or restaurants, especially if you represent local groups/clubs or if your party is for a charitable cause. You could also host your party at an outdoor venue such as a park, botanical gardens, or even your backyard. People enjoy a masquerade party because it allows them to take on a new persona, play a character, and be someone other than themselves for a few hours, without anyone knowing their true identity. When planning your party be sure to invite only those who will feel comfortable wearing a masquerade costume and creating a facade. 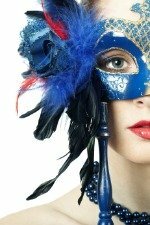 Since costumes and mask wearing are such an important part of a masquerade party's success, you may want to consider it a requirement. You can even include plain white masks with your invitations and ask your guests to decorate them for party night. This takes the pressure off them to find a mask, and ensures that everyone comes in a disguise. You may also wish to have a few extra masks available for those who arrive without one. No matter which theme you choose, it is important to keep the lighting dim. After all, the point is to remain disguised as long as possible so your goal is to create an ambience of mystery and curiosity. Candles, lanterns, torches, and small Christmas lights are great, inexpensive choices. Invitations should be theme appropriate, but can be as simple or as extravagant as you wish. Regardless of which invitation you choose, be sure to include the date, time, location, whether you will be providing a full course meal or finger foods only, and any expectations you have for costumes and masks. If you are hosting a masquerade mystery party, make sure you include any character information each guest will need to know so they have plenty of time to prepare. Since this is a masquerade party and everyone will be coming in disguise, you may want to have a board listing all your guests names , especially if you are challenging them to identify each other. A full course meal is acceptable if it would suit your party theme and you have the ability or resources to plan one; however, it is not necessary to make your masquerade party a success. In fact, hors d'oeuvres and finger foods are often preferable so guests can mingle, participate in events, solve a murder mystery, or pursue a treasure hunt. Messy or difficult to eat foods are often a problem when wearing a mask, and you don't want eating to become a distraction. Food can be presented on a single table, or placed around the venue so guests can nibble while they socialize. It can be made theme appropriate by including some traditional dishes from certain eras or cultures, cutting or shaping food to fit the theme, or simply serving snacks and beverages in theme related dishes. As with all parties, there should be several non-alcoholic beverage choices available. The most popular activity chosen for a masquerade party is dancing. You can hire a DJ, quartet, band, or play your own selections. If there are particular dances associated with your theme (ie. Branle or Pavane for the Medieval/Renaissance era, square dancing for a western party, or the Victorian Waltz) you may want to bring in somebody who can teach the steps to your guests and then have prizes for the best dancers. Having a murder mystery masquerade party is also very popular, as well as incorporating a scavenger/treasure hunt. Game areas could be set up featuring period specific games, or more modern, easy to play games that encourage socializing. Whatever activities you choose, remember the age and interests of your guests, and try to include something for everyone. If you are hosting a New Year's Eve party, you could fill piñatas, or balloons with confetti and arrange to have them opened at midnight. Also, as the clock strikes twelve, all guest could unmask, revealing their true identities.